Click on the image for a bigger resolution! 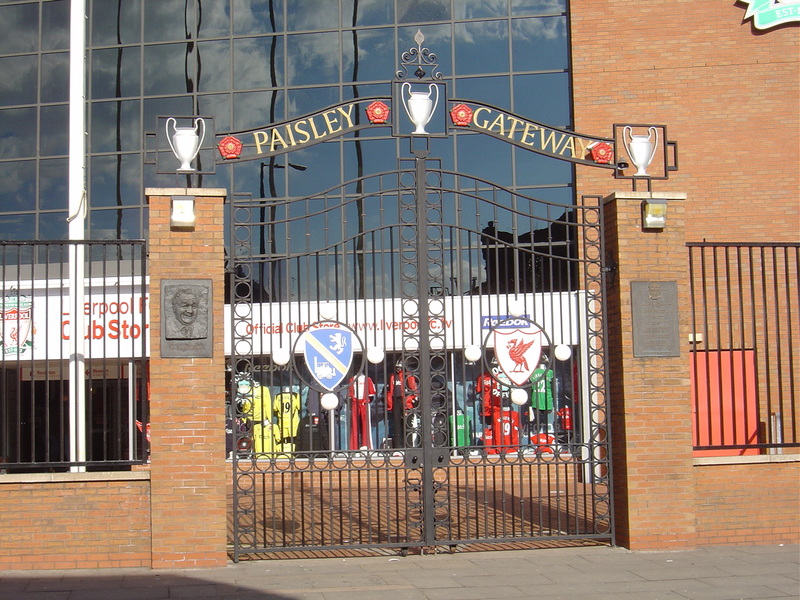 On Thursday April 8th 1999, Liverpool Football Club unveiled a new set of commemorative gates in front of the new Kop stand on Walton Breck Road. 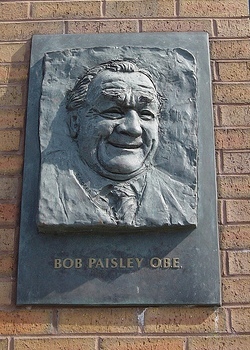 The 'Paisley Gateway' was a belated but welcome tribute by the club towards one of it's greatest servants, Bob Paisley. 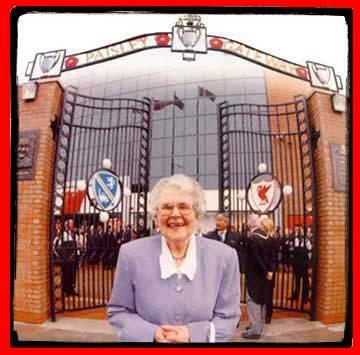 Bob's widow, Jessie, had taken an instrumental role in the design of the gates in tandem with architects Atherden Fuller Leng, who also designed the Shankly Gates and the Hillsborough Memorial. Jessie was the guest of honour, uncovering the gates to a wide and appreciative audience. The gates stand at an imposing four and a half metres in height and weigh over two tons and the foundations beneath them had to be specially strengthened to hold them in place. Prominent in the design of the gates is the European Cup, appearing in three places across the top archway, one for each of Bob's triumphs in Rome, London and Paris. The gates themselves feature the crests of Bob's birthplace, Hetton-le-Hole, and the liver bird of his 'adopted' city of Liverpool. The Hetton-le-Hole crest is made up of an eye-catching early steam engine, an acknowledgement of the area's pioneering role in the rail revolution. Four footballs surround each of the crests. On the brick pillars that flank the gates sit two bronze reliefs, one depicting the man himself and the other detailing the list of honours he brought to Liverpool FC. Other family members present at the unveiling were Bob and Jessie's sons Robert and Graham and their daughter Christine as well as Bob's brother Hughie and his wife Mary, who had travelled down from Hetton. Jessie was presented with a ceremonial key to the gates and paid the following moving tribute to her late husband. "If this was an Oscar ceremony I would be expected to fling my arms around, burst into tears and say Bob didn't deserve it. But although the tears aren't far away, I'm not going to say that. If you ask me if Bob deserved it, I say 'Yes, 100 percent'." After breakfast the next morning, they call this big meeting upstairs and around the table there’s Bob, Joe Fagan, Moran, Evo and Mr Moss, who stands up. ‘I’ve been at this club for over 20 years and I’ve never witnessed anything like last night in my life. I’ve had many accolades passed on to me, but never have I received one so touching than from David Hodgson.’ Then they lift the tablecloth and underneath it’s piled high with beer!’ After that meeting, Bob Paisley turned to me and said: ‘You’re a good Geordie, son. That’s what you are.’"